Technical Support Associates assist the customers or employees in solving their technical issues. 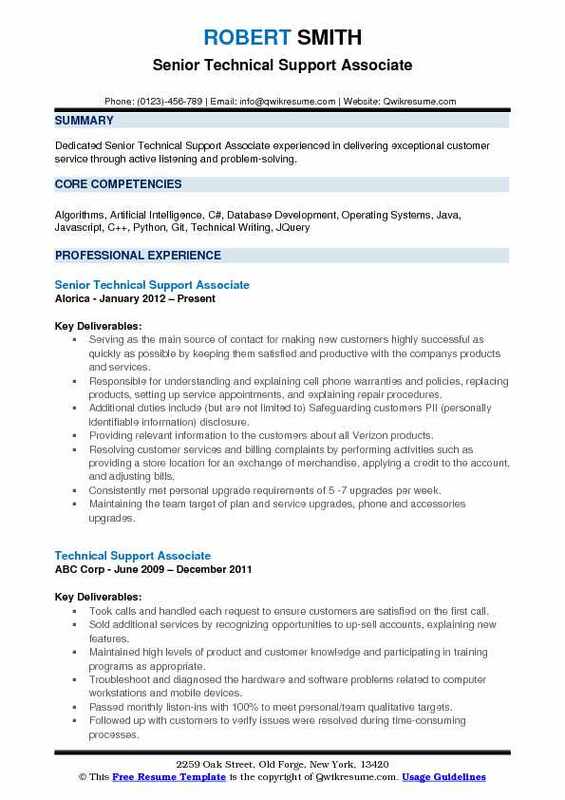 The normal duties that can be found on a successful Technical Support Associate Resume include – receiving phone calls and listening to the complaints, identifying the technical problems, giving on-phone technical support for easy problems, making appropriate recommendations based on the problem to fix them, assisting in writing manual user guides, taking charge of all escalated issues, performing activation and de-activation tasks, redirecting problem to appropriate resource, processing and recording all transactions and making scheduled callbacks to customers if needed. 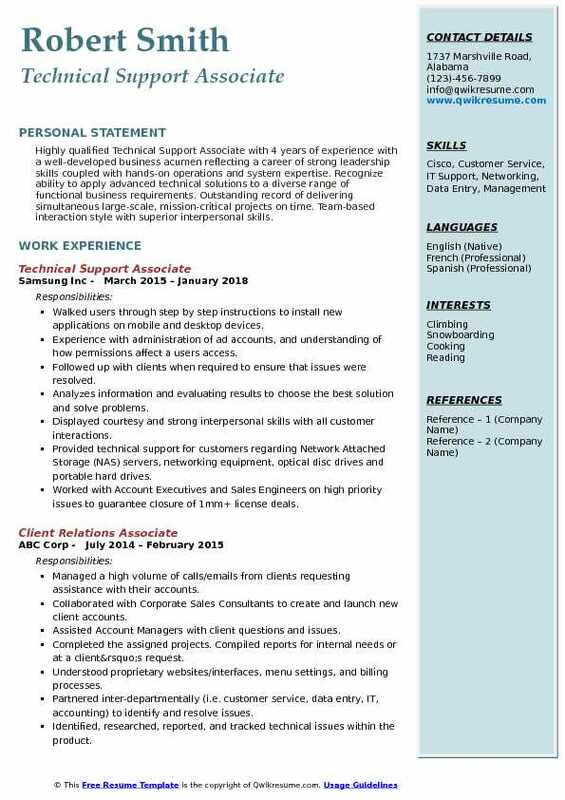 Those looking forward to providing such assistance need to mention in the resume the following competencies – technical expertise, problem-solving skills, the ability to multi-task, customer focus, attention to details, telephone etiquette, knowledge of relevant software application or equipment, and effective listening skills. While a high school diploma is considered as the minimum qualification for this post, employers prefer a technical diploma with proper on-job training. Headline : Technical Support Associate with 6 years of experience of Core Java and Web-based applications with expertise in reviewing client requirement; prioritize requirements, creating project proposal (scope, estimation) and baseline project plan. Developed and maintained Usual Test Cases and Test reports as assigned by the senior specialists. Designed and modeled projects using techniques in UML - Use Cases, Class Diagrams, Sequence Diagrams, etc. Appointed key point person for all customer service issues company-wide. Communicated with and assisted employees regarding their mailing requests. Ran post-implementation review survey results in the requisite survey software. Assisted in making reservations, conference registrations, and other travel related necessities. Created and maintained Microsoft SQL query for reporting weekly measurements. Worked with development on the testing of new client-based applications and impact of new software on existing. Ensured third-party support contractors meet the defined service levels. Performed workstation setup installing software and peripherals and performs maintenance/cleaning and repairs. Assisted in managing the image releases with external equipment suppliers. Provide troubleshooting through identifying problems, researching possible solutions, and guidance through corrective steps. Summary : Dedicated Senior Technical Support Associate experienced in delivering exceptional customer service through active listening and problem-solving. Serving as the main source of contact for making new customers highly successful as quickly as possible by keeping them satisfied and productive with the company's products and services. Responsible for understanding and explaining cell phone warranties and policies, replacing products, setting up service appointments, and explaining repair procedures. Additional duties include (but are not limited to): Safeguarding customers PII (personally identifiable information) disclosure. Providing relevant information to the customers about all Verizon products. Resolving customer services and billing complaints by performing activities such as providing a store location for an exchange of merchandise, applying a credit to the account, and adjusting bills. Consistently met personal upgrade requirements of 5 -7 upgrades per week. Maintaining the team target of plan and service upgrades, phone and accessories upgrades. Maintaining flexibility with changes to policy/procedures, responsibilities and schedules. 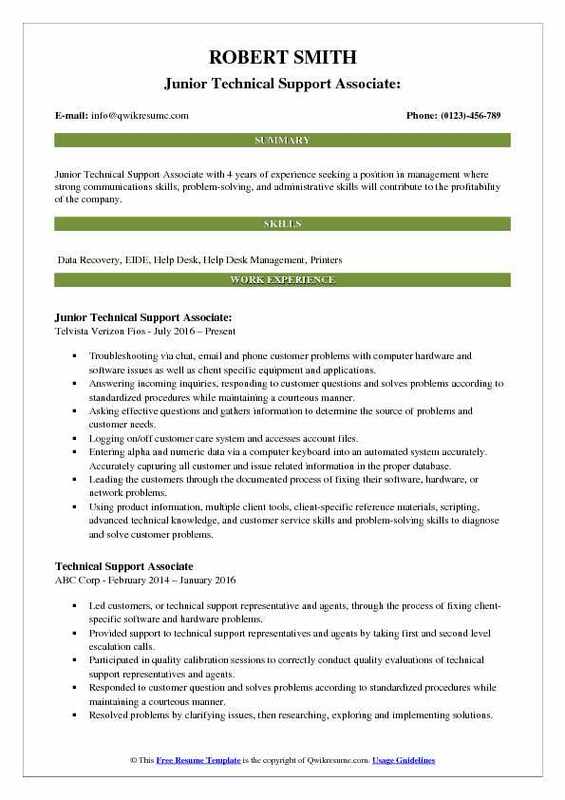 Objective : Junior Technical Support Associate with 4 years of experience seeking a position in management where strong communications skills, problem-solving, and administrative skills will contribute to the profitability of the company. Troubleshooting via chat, email and phone customer problems with computer hardware and software issues as well as client specific equipment and applications. Answering incoming inquiries, responding to customer questions and solves problems according to standardized procedures while maintaining a courteous manner. Asking effective questions and gathers information to determine the source of problems and customer needs. Logging on/off customer care system and accesses account files. Entering alpha and numeric data via a computer keyboard into an automated system accurately. Accurately capturing all customer and issue related information in the proper database. Leading the customers through the documented process of fixing their software, hardware, or network problems. Using product information, multiple client tools, client-specific reference materials, scripting, advanced technical knowledge, and customer service skills and problem-solving skills to diagnose and solve customer problems. Monitoring and coaching the Technical Support Representatives and Agents regarding client specific procedure and requirements. 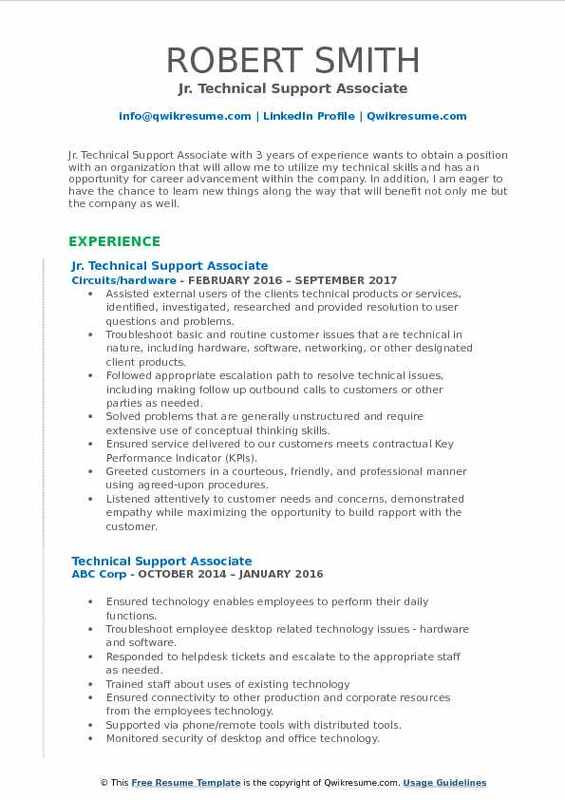 Objective : Jr. Technical Support Associate with 3 years of experience wants to obtain a position with an organization that will allow me to utilize my technical skills and has an opportunity for career advancement within the company. In addition, I am eager to have the chance to learn new things along the way that will benefit not only me but the company as well. Assisted external users of the client's technical products or services, identified, investigated, researched and provided resolution to user questions and problems. Troubleshoot basic and routine customer issues that are technical in nature, including hardware, software, networking, or other designated client products. Followed appropriate escalation path to resolve technical issues, including making follow up outbound calls to customers or other parties as needed. Solved problems that are generally unstructured and require extensive use of conceptual thinking skills. Ensured service delivered to our customers meets contractual Key Performance Indicator (KPIs). Greeted customers in a courteous, friendly, and professional manner using agreed-upon procedures. Listened attentively to customer needs and concerns, demonstrated empathy while maximizing the opportunity to build rapport with the customer. Prepared complete and accurate work including appropriately notating accounts as required. Participated in activities designed to improve customer satisfaction and business performance. Objective : Highly qualified Technical Support Associate with 4 years of experience with a well-developed business acumen reflecting a career of strong leadership skills coupled with hands-on operations and system expertise. Recognize ability to apply advanced technical solutions to a diverse range of functional business requirements. Outstanding record of delivering simultaneous large-scale, mission-critical projects on time. Team-based interaction style with superior interpersonal skills. Walked users through step by step instructions to install new applications on mobile and desktop devices. Experience with administration of ad accounts, and understanding of how permissions affect a users access. Followed up with clients when required to ensure that issues were resolved. Displayed courtesy and strong interpersonal skills with all customer interactions. Provided technical support for customers regarding Network Attached Storage (NAS) servers, networking equipment, optical disc drives and portable hard drives. Worked with Account Executives and Sales Engineers on high priority issues to guarantee closure of 1mm+ license deals. Utilized third-party tools to assist in troubleshooting such as Fiddler, Wireshark, and Firebug. Assist users of the clients products and services by answering questions and using critical thinking to solve problems involving their use. 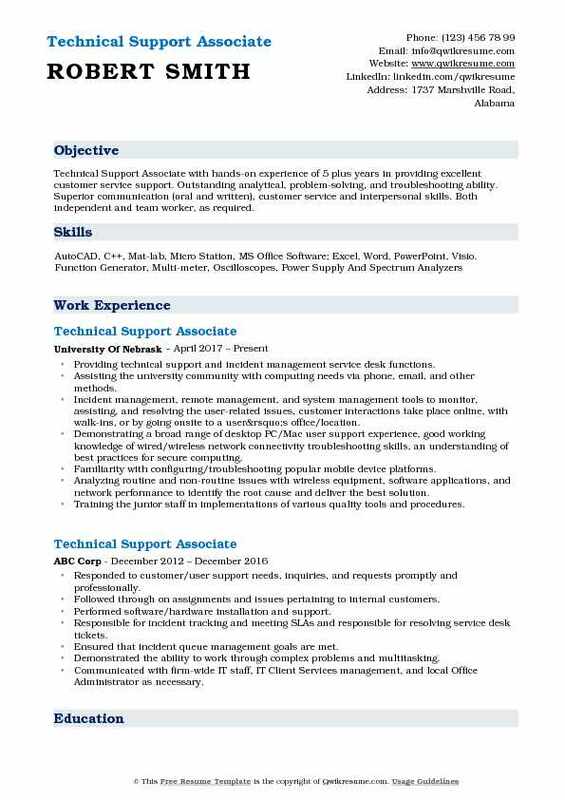 Headline : Technical Support Associate with hands-on experience of 5 plus years in providing excellent customer service support. Outstanding analytical, problem-solving, and troubleshooting ability. Superior communication (oral and written), customer service and interpersonal skills. Both independent and team worker, as required. Providing technical support and incident management service desk functions. Assisting the university community with computing needs via phone, email, and other methods. Incident management, remote management, and system management tools to monitor, assisting, and resolving the user-related issues, customer interactions take place online, with walk-ins, or by going onsite to a user’s office/location. 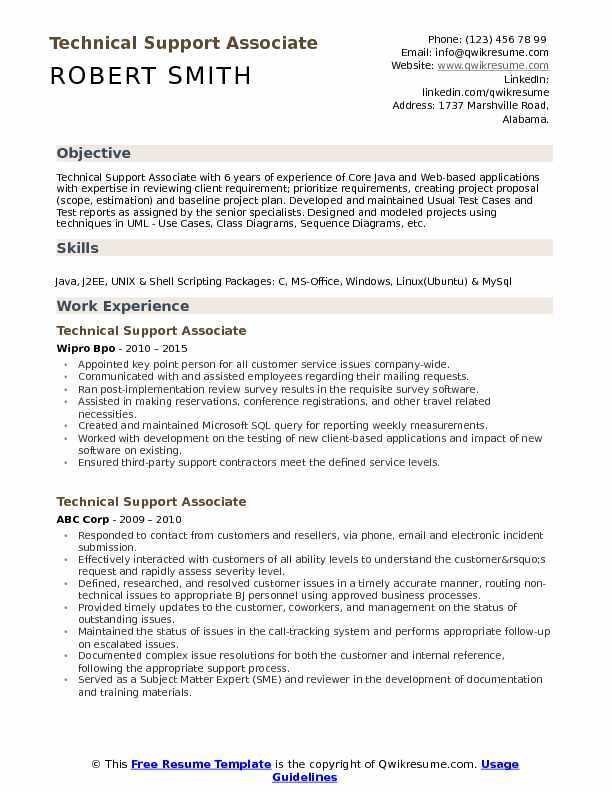 Demonstrating a broad range of desktop PC/Mac user support experience, good working knowledge of wired/wireless network connectivity troubleshooting skills, an understanding of best practices for secure computing. Familiarity with configuring/troubleshooting popular mobile device platforms. Analyzing routine and non-routine issues with wireless equipment, software applications, and network performance to identify the root cause and deliver the best solution. Training the junior staff in implementations of various quality tools and procedures. Create, manage, and escalation of tickets at the end of the shift for unresolved issues. Objective : Technical Support Associate skilled at assisting customers, solving their problems and directing them in the right direction. I can solve complex problems and answer questions in a timely manner. I enjoy troubleshooting to find solutions to technical issues. 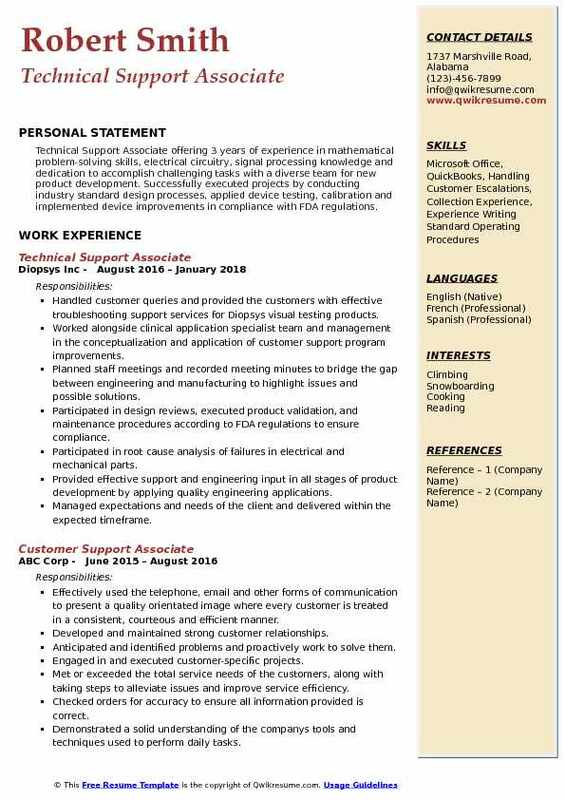 Outgoing person looking to further advance into job career fields. Delivering service and support to end-users using and operating automated call distribution phone software, via remote connection or over the internet. Interacting with the customers to provide and process information in response to inquiries, concerns, and requests about products and services. Gathering the customers' information and determining the issue by evaluating and analyzing the symptoms. Accurately processing and recording the call transactions using a computer and designated tracking software. Organizing ideas and communicating the oral messages appropriate to listeners and situations. Following-up and making scheduled call-backs to customers where necessary. Taking inbound calls from customers regarding website and account-related concerns. 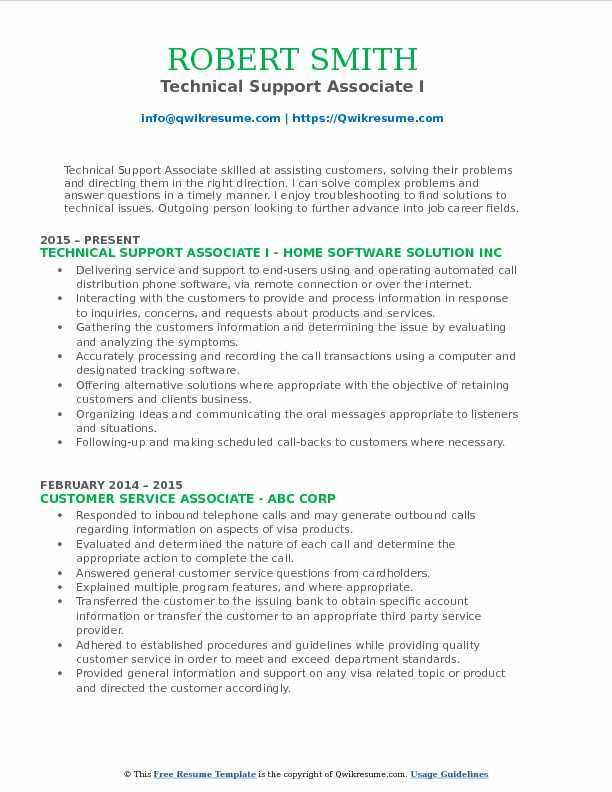 Objective : Technical Support Associate with 3 years of experience. Provides a single point of contact for end users to receive support and maintenance within the organizations desktop computing environment. This includes installing, diagnosing, repairing, maintaining and upgrading all PC hardware and equipment to ensure optimal workstation performance. 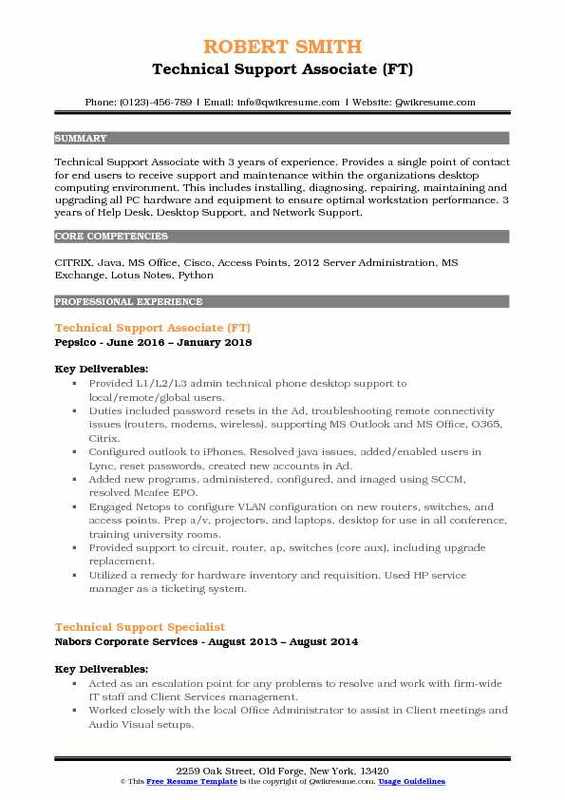 3 years of Help Desk, Desktop Support, and Network Support. Provided L1/L2/L3 admin technical phone desktop support to local/remote/global users. Duties included password resets in the Ad, troubleshooting remote connectivity issues (routers, modems, wireless), supporting MS Outlook and MS Office, O365, Citrix. Configured outlook to iPhones. Resolved java issues, added/enabled users in Lync, reset passwords, created new accounts in Ad. Added new programs, administered, configured, and imaged using SCCM, resolved Mcafee EPO. Engaged Netops to configure VLAN configuration on new routers, switches, and access points. Prep a/v, projectors, and laptops, desktop for use in all conference, training university rooms. Provided support to circuit, router, ap, switches (core aux), including upgrade replacement. Utilized a remedy for hardware inventory and requisition. Used HP service manager as a ticketing system. Objective : Technical Support Associate offering 3 years of experience in mathematical problem-solving skills, electrical circuitry, signal processing knowledge and dedication to accomplish challenging tasks with a diverse team for new product development. Successfully executed projects by conducting industry standard design processes, applied device testing, calibration and implemented device improvements in compliance with FDA regulations. Handled customer queries and provided the customers with effective troubleshooting support services for Diopsys visual testing products. Worked alongside clinical application specialist team and management in the conceptualization and application of customer support program improvements. Planned staff meetings and recorded meeting minutes to bridge the gap between engineering and manufacturing to highlight issues and possible solutions. Participated in design reviews, executed product validation, and maintenance procedures according to FDA regulations to ensure compliance. Participated in root cause analysis of failures in electrical and mechanical parts. Provided effective support and engineering input in all stages of product development by applying quality engineering applications. Managed expectations and needs of the client and delivered within the expected timeframe. Monitored the functionality of technical equipment and applied patch updates when needed. 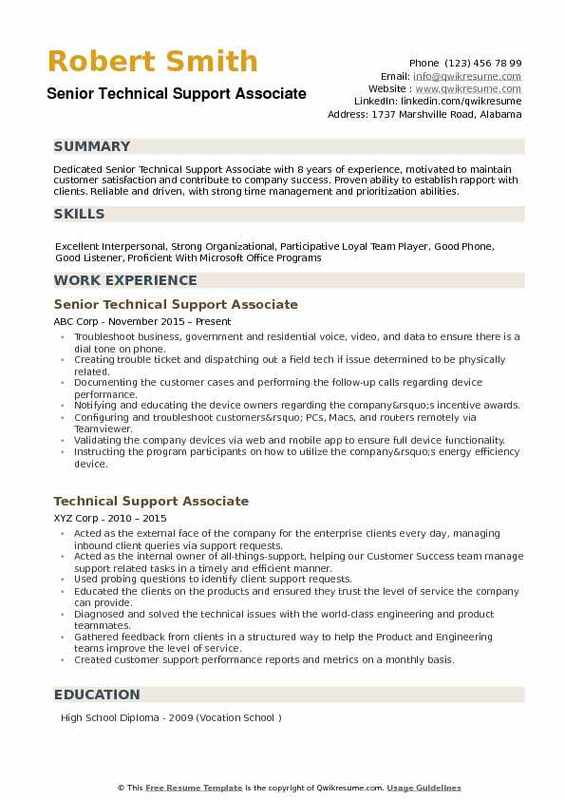 Summary : Dedicated Senior Technical Support Associate with 8 years of experience, motivated to maintain customer satisfaction and contribute to company success. Proven ability to establish rapport with clients. Reliable and driven, with strong time management and prioritization abilities. Troubleshoot business, government and residential voice, video, and data to ensure there is a dial tone on phone. Creating trouble ticket and dispatching out a field tech if issue determined to be physically related. Documenting the customer cases and performing the follow-up calls regarding device performance. Notifying and educating the device owners regarding the company’s incentive awards. Configuring and troubleshoot customers’ PCs, Macs, and routers remotely via Teamviewer. Validating the company devices via web and mobile app to ensure full device functionality. Instructing the program participants on how to utilize the company’s energy efficiency device. Addressing the incoming technical calls, web chats, emails, and social media requests from program participants. Using case management to log and resolve basic and routine customer inquiries. Following templates to resolve, schedule follow-up and/or escalate the customers call.